With the Mongoose Men’s Impasse HD Mountain Bicycle, be ready to take on rugged terrains. Sporting a sturdy Aluminium Frame, this bicycle comes with a Shimano Derailleur, a front and rear disc for efficient braking and a front suspension fork that absorbs shocks from bumpy ride on rough and uneven terrain. A 21 Speed Shimano Derailleur installed with SRAM Twist Shifters for smooth changing of gears. Sturdy Aluminium frame (29inch) for durability and reliability. Front suspension fork serving as excellent shock absorbers, thereby reduce impact on rider when biking on rough terrain. Front & rear disc brakes for greater braking power. High quality kickstand to help the bicycle keep upright. Comes in a rich Matte Red color. 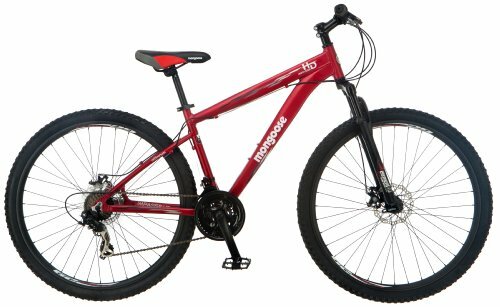 The Mongoose Men’s Impasse HD Mountain Bicycle is a pretty good bike that rides fast and smooth. It comes partially assembled right out of the box and not too difficult to fully assemble. The bicycle looks very impressive and the aesthetics is top notch with its matte red on black color which makes it look really sharp and sweet. The tires offer low rolling resistance while riding on the street; however, they are not very appropriate for riding on hard off road terrain. Same for the fork, they are perfect for the street, but they could have been made a bit stiffer, so could provide more flexibility to the user. The wheels were tweaked slightly, but it’s hardly noticeable when going downhill. The seat and pedals are quite well presented, the front tire and handlebars worked really well. The twist grip shifters did not require any adjusting as it worked flawlessly which was quite good. The brakes required proper adjustment and even after it was done they were a bit jerky and not so much as effective. It needs a bit getting used for the most part of it, but once you get the hang of it, it offers a very great and nice riding experience. For the price, the 29″ tires and aluminium wheel together with the shimano derailleur which rides well, this bicycle comes recommended as it is worth paying for.